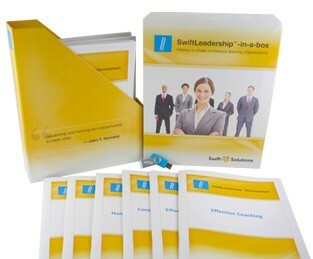 SwiftLeadership™-in-a-box is a 12 month off the shelf leadership development program designed to be delivered by managers to frontline supervisors during their regularly scheduled staff meetings. Depending on organization structure, it can also be facilitated by internal HR teams to their leadership teams. Purchase a complete set (12 month program) or as individual modules. All materials are available on a customized portal. The topics are designed to be taught in any order, depending upon the needs of your organization. The result of this program is that we begin to stop thinking of learning as a single training event and begin to shift our organizations into learning cultures, and we increase effectiveness and capacity within our organizations.